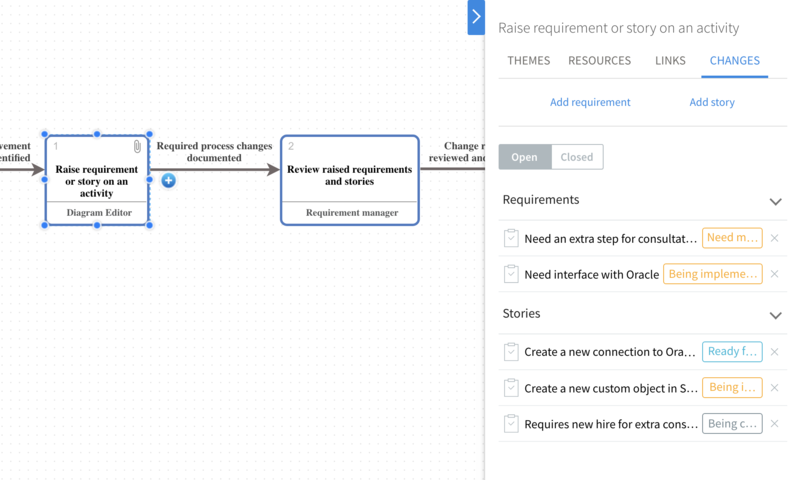 On a PRO space you can easily raise requirements and stories from the diagram activities. 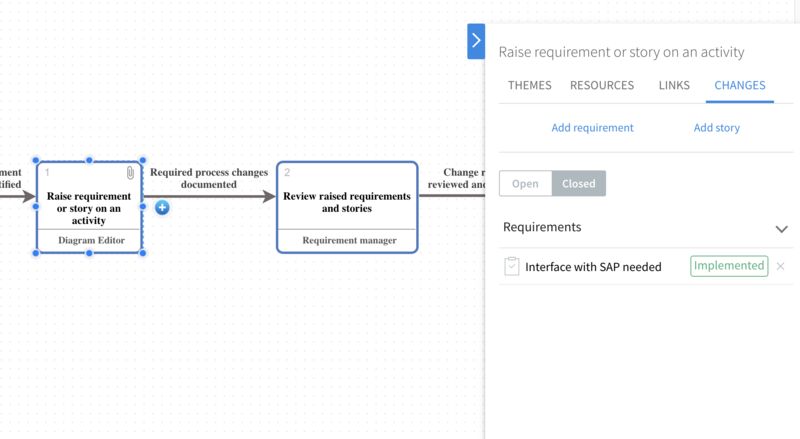 You can also see the status of requirement and story implementation for each activity, as well as of all requirements and stories for the whole process diagram. If you integrated with JIRA, stories linked to an activity will also display links to JIRA projects. And finally, you can easily toggle between viewing requested or worked on process changes, and viewing the history record of all implemented changes. 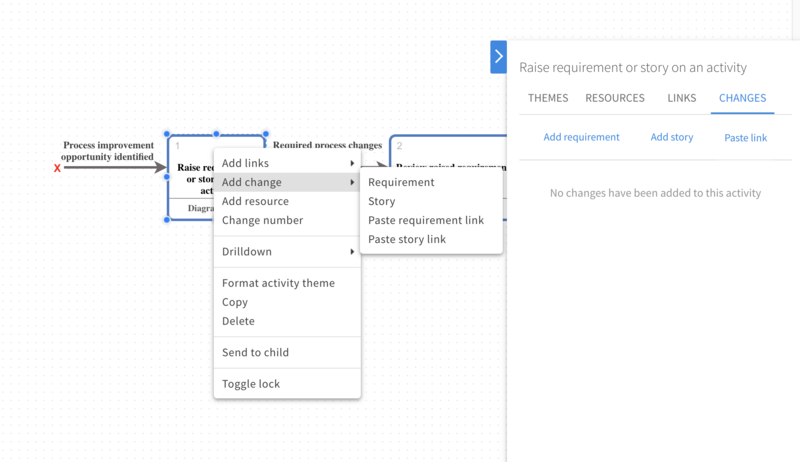 You can add requirements & stories to a diagram activity by either right-clicking on the activity and selecting an option “Add change”, or by opening the right panel for an activity and choosing an option to “Add requirement” or “Add story” in the Changes tab. In both cases, you will have an option to either add one-to-many requirements/stories already existing in the system or to create a new one. All requirements and stories are displayed with their current status in the Changes tab. This allows you to see & track change implementation. In order to view details about the linked requirement or story simply roll over it in the right panel and you'll see a popover with the crucial info. Click on the name of the requirement/story at the top of the popover to navigate to the item. If you switch to “Closed” list you will see all the requirements & stories that have been raised on this activity in the past & have been implemented. This is effectively your change history record. 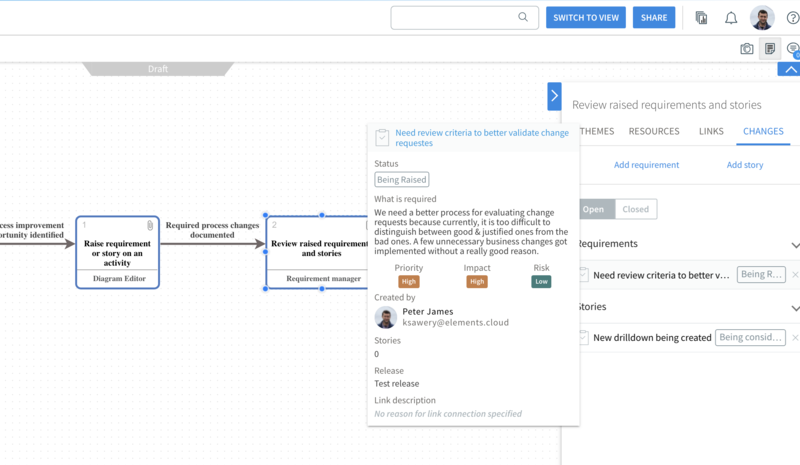 The closed list of requirements & stories is dependent on what statuses are marked as “closed” category status in your requirements/story workflows. These can be customized in Space Management. On top of that, you can also view the “Changes” tab in the diagram's right panel. If you have your right panel open just click on the canvas to switch to the diagram's right panel from the activity's right panel. The Changes tab on the diagram lists all requirements & stories raised in the scope of this diagram, i.e. all activities. You cannot remove these links in this view, just view the currently open and closed requirements & stories. This becomes your change dashboard for the whole diagram.